45 days, 13 hours, 42 minutes, 53 seconds –it is a new time of the round the world regatta Jules Verne Trophy, which was recorded by the famous timekeeper - Corum. As a partner and official sponsor of the legendary sea-voyage, full of adventure, without the right to rest and help from outside, the Swiss watch company during the voyage is accompanied by the famous sailor Loïc Peyronie and an excellent team of Tri-Maxi BanquePopulaire V.
Paying tribute to the victory of the crew, the company Corum has awarded 14 members of the team and their onshore router with a specially issued wristwatch “Trophée Jules Verne 2011-2012”. All team members in April 2, 2012 were presented with Admiral's Cup Seafender 48 Chrono Centro watch from Admiral’s Cup flagship line, which was first presented by the company in 1960. On the dial there is an inscription “Trophée Jules Verne 2011-2012”, and on the back side of the watch is pepicted a plan of the route. The name of each owner is applied to the back of the watch. For presentation gifts the screw was invited to La Chaux-de-Fonds, Switzerland, where each of them has become an owner of a reliable companion – the Admiral's Cup Seafender 48 Chrono Centro watch. Loic Peyron, a skipper of the trimaran and the official ambassador of the company Corum, expressed his appreciation and said: "When confronted with difficulties, it is desirable to be well-equipped. 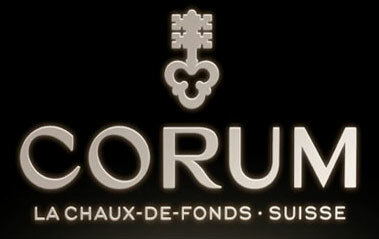 We would like to thank the company Corum for their continued support and crew Maxi BanquePopulaire V for their loyalty. The whole team is proud to have on the wrists a symbol of extraordinary adventures." CEO of Corum, Antonio Calci expressed his gratitude with the following words: "I am very pleased to see the whole crew of the Maxi BanquePopulaire V in La Chaux-de-Fonds. The fact that each team member personally has come here to get a watch with an inscription of the own name speaks for itself. Their presence indicates the possibility of our partnership and sense of camaraderie, which the brand Corum develops together with its partners. "